In this week’s MCN we reveal why the 2003 Triumph Daytona 600 could equal Japan’s best. Kevin Ash visits Spain to test the Daytona on both the road and track and finds that the Triumph can stand proud against the competition without any allowances for the British badge. The fuelling is improved from the old TT600 and does away with any coughs and splutters at low revs. 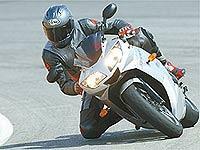 The old bike was acclaimed as arguably the best-handling 600 when it was launched three years ago. The new Daytona chassis is even better with faster handling, greater stability, and better feedback from the front than a Yamaha R6. The indications are that it could be the best 600 Supersport bike on the road yet. To find out more, you’ll need to read MCN, out April 9. Plus, in this issue, we’ve got the best ever MV F4 and an interview with boss Claudio Castiglioni, a 200bhp Hayabusa streetfighter, news of the first race-rep 2003 Honda CBR600RRs, the R1 for teenagers, first pictures of a new attempt to resurrect the Norton badge, Kevin Ash, the Insider section reveals huge discounts available on new tyres and new bikes, Be An Expert on the Yamaha Thundercat, the Akrapovic system for the CBR600RR, win one of 12 EDZ undersuits, kneesliders tested and rated, Buell’s XB9S vs the new Monster 1000, the Kawasaki VN1600 Classic, What’s On, news from the opening GP at Suzuka, Michael Scott, Ducati’s dream debut, Rossi’s rider revolt, Colin Edwards writes for MCN, KTM’s £2 million 125cc bike, British Superbikes Privateer Cup, An electric motocross bike, why and how you should go green laning, Be an Expert on the Honda XR400R. Plus, free with MCN this week, our 16-page-guide to our 50 favourite used bikes. All this is in MCN, out April 9.